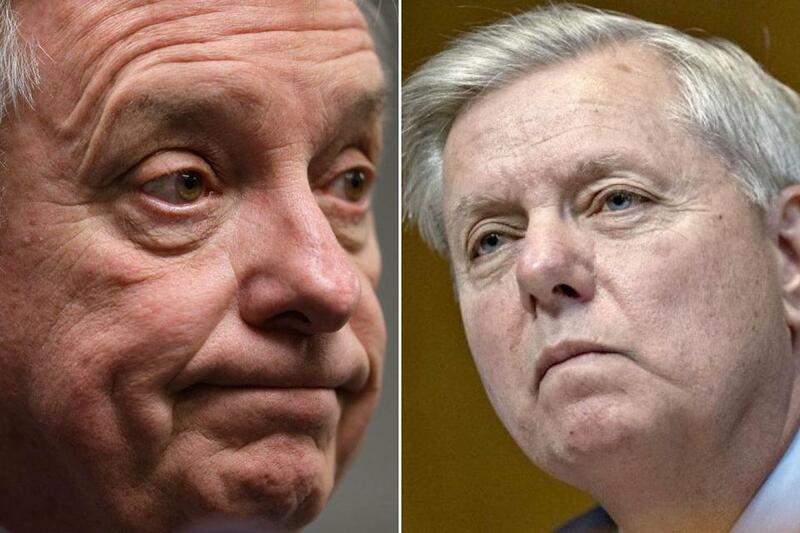 Senators Richard Durbin (left), a Democrat, and Lindsey Graham, a Republican, have worked on a deal linking immigration to a spending bill. WASHINGTON — President Trump’s incendiary words about immigration have dampened the prospects that a broad spending and immigration deal can be reached by the end of the week, raising the possibility of a government shutdown with unknown political consequences for lawmakers in both parties. Democrats facing reelection in states that Trump carried in 2016 fear that a government funding crisis, precipitated by an immigration showdown, could imperil their campaigns. And they are growing increasingly uneasy that liberal colleagues eyeing White House bids are demanding that any spending bill beyond a stopgap measure that expires on Jan. 19 include protections for immigrants brought to the United States illegally as children. “Welcome to our world,” said Senator Claire McCaskill, a Missouri Democrat, who is running for reelection in a state that Trump carried by 19 percentage points. But Republicans face their own uncertainties. With their party controlling the White House and both chambers of Congress, they could receive most of the blame for a shutdown, even if Senate Democrats effectively block a spending plan that does not extend the immigrant protections of an Obama-era program known as the Deferred Action for Childhood Arrivals, or DACA. “To believe that you can successfully blame Democrats for a shutdown over the DACA debate is naïve,” said Senator Lindsey Graham, Republican of South Carolina. The angry recriminations continued from allegations that Trump used derogatory language to describe Haiti, El Salvador, and African nations during a White House meeting last week with lawmakers. The president on Monday attacked Senator Richard J. Durbin of Illinois, the No. 2 Democrat who is leading the immigration talks for his party and attended the White House meeting, as having “totally misrepresented” Trump’s comments in his public recounting of them. And two Senate Republicans, Tom Cotton of Arkansas and David Perdue of Georgia, have raised questions over whether the term was even used, with Perdue flatly denying it had. Graham, who admonished Trump in the meeting, has called Durbin’s account basically accurate. He took an unmistakable swipe Monday at Perdue and Cotton. Ten Democratic senators are on the ballot this November in states that are heavily white, that have little sympathy for unauthorized immigrants, and that Trump won. Many of these lawmakers have no desire to force a shutdown over an immigration issue. Some of the party’s most at-risk seats are in Missouri, Indiana, West Virginia, and North Dakota. If they side with Senate Republicans, Congress could pass yet another short-term spending bill by Friday that would end the shutdown threat for now as negotiations continue. But some Democrats considering presidential runs, such as Senators Kamala Harris of California, Cory Booker of New Jersey, and Kirsten Gillibrand of New York, are pressing Democrats to oppose any government-funding bill — no matter how short-term — that does not also protect the approximately 800,000 young immigrants brought to the United States as children, known as “Dreamers.” Trump rescinded the program in September and gave Congress six months to enshrine its protections into law. Cotton, an immigration hard-liner, suggested that these Democrats will pay a price if their brinkmanship goes too far and they are seen as shutting down the government if they cannot offer amnesty for unauthorized immigrants. What most alarms congressional negotiators is that political imperatives appear to have overtaken the immigration policy deliberations in the still-unfolding debate over Trump’s vulgar description of some nations in Thursday’s meeting. Two of the Republicans involved in the discussions complained Monday that the days-long controversy over Trump’s comment had imperiled hopes for an agreement. Graham said he spoke with the president on the telephone Saturday and urged him to show the sort of leadership and restraint that many Republicans were pleasantly surprised to see during an earlier, televised immigration discussion in the White House last Tuesday. Short said the proposal offered by Graham and Durbin, which was summarily rejected by Trump during the contentious Oval Office meeting last week, remains the most likely basis for compromise as lawmakers and the White House attempt to find common ground. “It is on the table as a starting point for the congressional conversations,” Short said. He said those negotiations will begin again in earnest Tuesday, hosted by Representative Kevin McCarthy of California, the House majority leader, who dined with the president at the Trump International Golf Club in West Palm Beach on Sunday night. The negotiators include Durbin, who told local reporters in Illinois on Monday that he stood by his account of Thursday’s meeting with the president. Short, who declined to discuss how Trump characterized African nations, said the proposal devised by Graham and Durbin did not do enough to satisfy the president’s demands for enhanced border security. And, he said, it failed to broadly end what Republicans call “chain migration,” a process by which American citizens can eventually bring their extended families into the United States over a period of many years. Short argued that the current proposal would actually increase the ability of DACA recipients to bring some family members into the country since, under their current legal status, they are barred from sponsoring entry for anyone else.